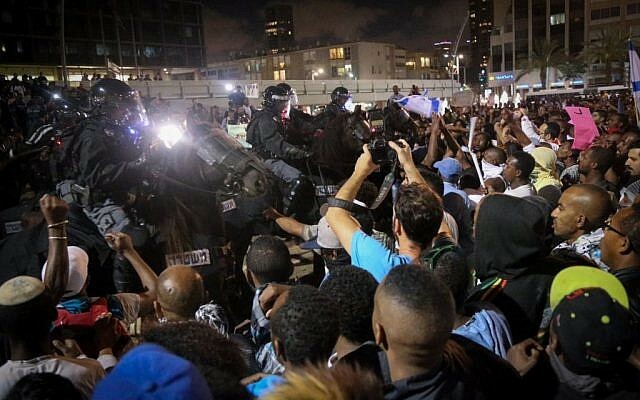 Tel Aviv saw intense clashes between police and protesters through the night Sunday, as a rally in support of the Ethiopian community against police brutality and racism turned violent, transforming the center of the city into a veritable war zone. At least 41 people were injured in the hours-long melee, which saw protesters hurl rocks at police and officers respond with stun grenades and water cannons. Several protesters were also arrested and police vowed to crack down on further unauthorized protests, even as some vowed to keep up the demonstration. 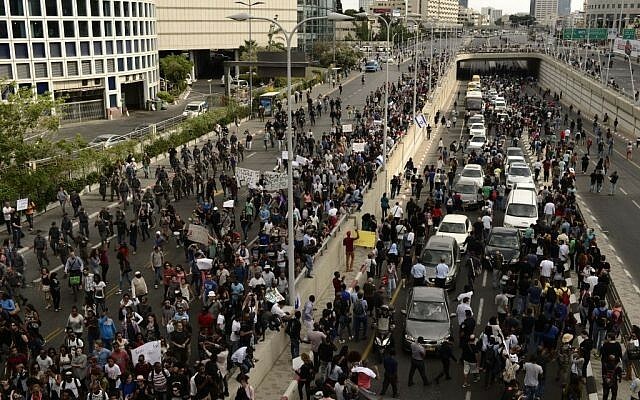 The protest began in the late afternoon as thousands of people, many of them from the community of Ethiopian Israelis, blocked the Ayalon highway and other main Tel Aviv thoroughfares. They later moved to Rabin Square, which would become the scene of hours of running battles between protesters and police. 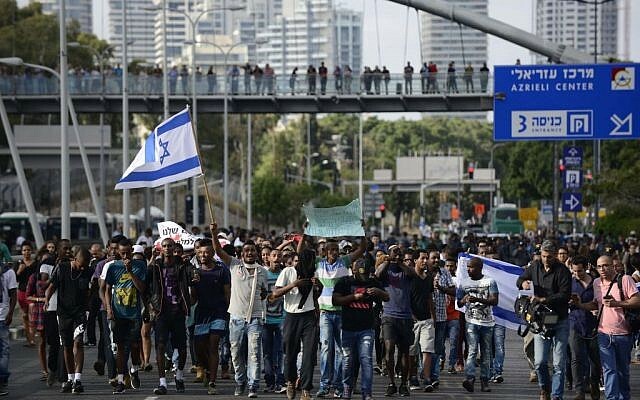 The protest, which followed a similar one in Jerusalem on Thursday, was meant to demonstrate against what members of the Ethiopian community claim is institutionalized racism, and was sparked by a video showing an unprovoked police beating of a member of the community. The initially peaceful rally became an increasingly chaotic riot, with some protesters throwing firecrackers, stones, and bottles at police as well as starting small fires. 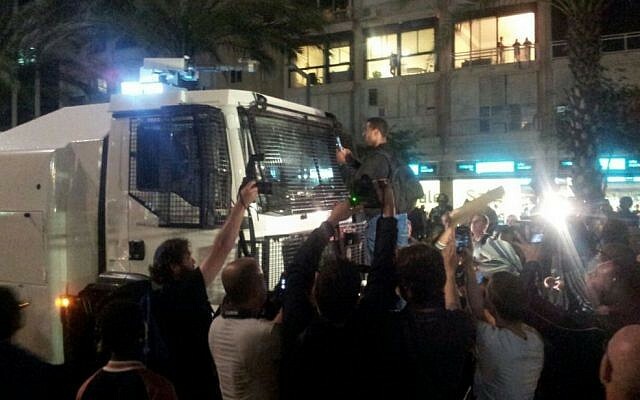 Police retaliated with tear gas, stun grenades, and eventually two mobile water cannon trucks arrived to disperse the crowds that maintained a running street battle in the square and approaching streets until late into the night. As Sunday turned to Monday, hundreds were still in and around the square, though most of the protesters had left. At least 23 police were injured in the clashes, and at least three people were arrested, according to media reports. Dozens of protesters were reported to have also been injured. Prime Minister Benjamin Netanyahu conferred with Public Security Minister Yitzhak Aharonovitch about the developments. Netanyahu called for calm and the restoration of order and promised to review the issues raised by members of the Ethiopian community over their position in Israeli society. 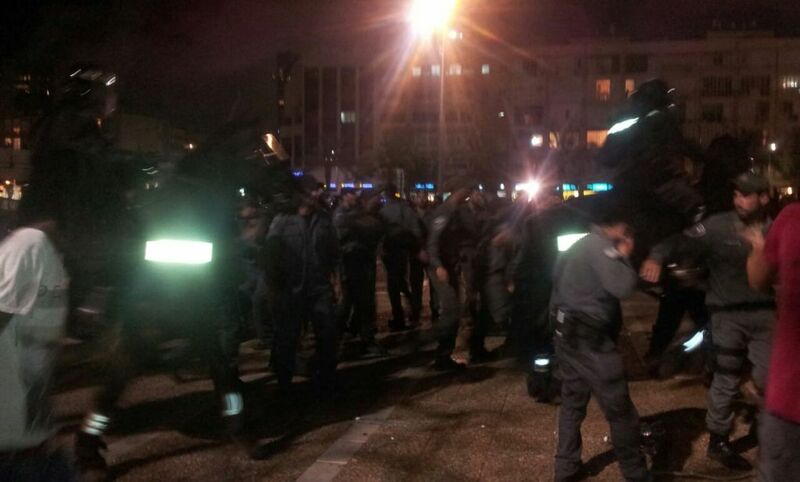 “All claims will be looked into but there is no place for violence and such disturbances,” Netanyahu said. 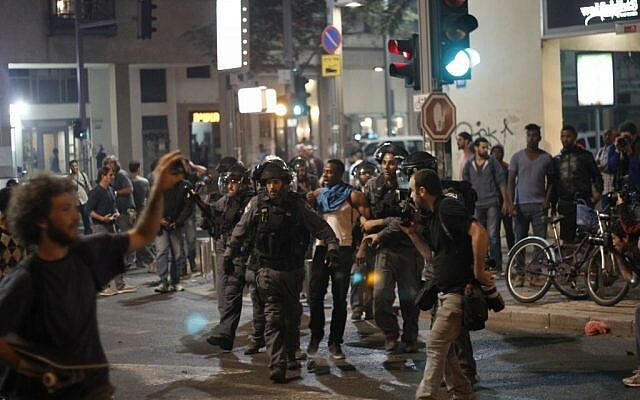 The protest came three days after a stormy demonstration in Jerusalem was sparked by footage showing two policemen beating a uniformed Israeli soldier of Ethiopian origin. Police spokesman Micky Rosenfeld said about 3,000 people took part in Sunday’s protest, though others put the number higher. 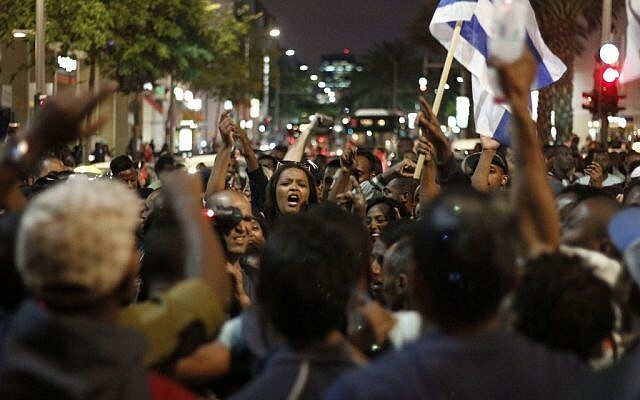 Aside from those of Ethiopian extraction, scores of other Israelis also joined Sunday’s rally, chanting and holding up signs reading: “A violent policeman must be put in prison” and “We demand equal rights”. 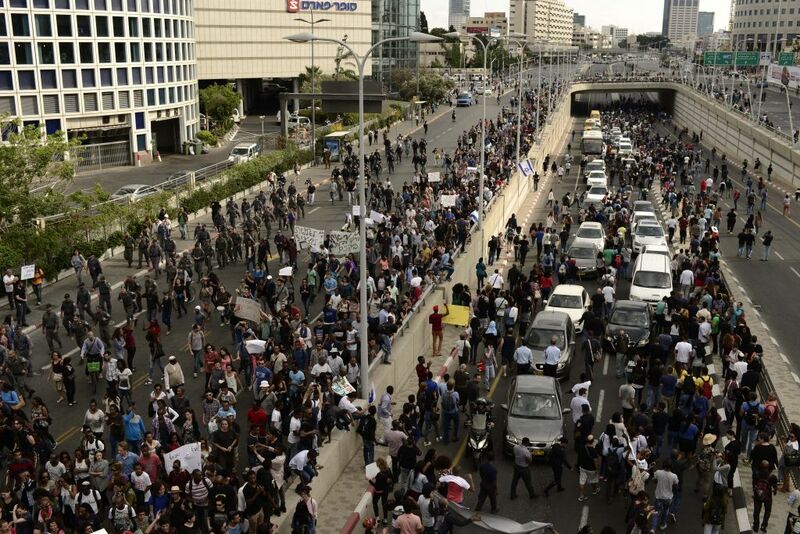 As they marched earlier through roads in central Tel Aviv, some held their arms in the air, wrists crossed as if handcuffed. It was the second such protest in several days and supporters say the demonstrations will continue. 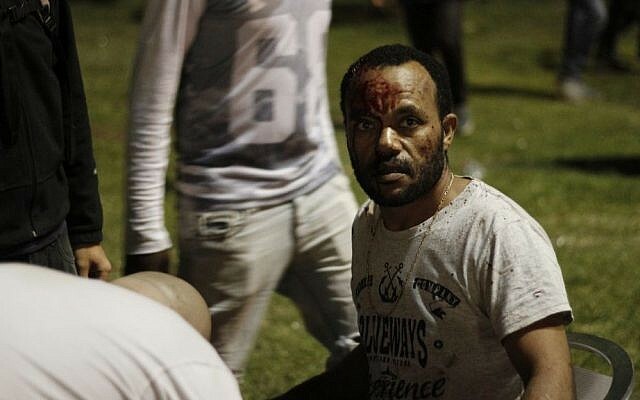 The protesters were galvanized by the publication of a video last Monday of Damas Pakada, an Israeli of Ethiopian origin, being beaten by two police officers while in his IDF uniform. Pakada, a 21-year-old orphan who emigrated from Ethiopia with his four siblings seven years ago, was seen being pushed to the ground by the policeman in an apparently unprovoked attack. Additional police who arrived at the scuffle arrested him. After the footage was obtained by Pakada’s family, he was released from custody, with police promising to investigate the matter. The footage sparked widespread anger in the community and prompted a surge of accusations of lingering institutional discrimination and racism. “It’s like we’re not a part of the country, it’s like we’re not worthy. It tires you, every day living like this,” she added. The Zionist Union’s MK Stav Shaffir, and former Yesh Atid MK Pnina Tamano-Shata — the first female Ethiopian-born Knesset member — were in attendance at the event. “Being black, I have to protest today,” 34-year-old Eddie Maconen told AFP. “I never experienced police violence against me personally, but it is aimed at my community which I have to support,” he said. Maconen, who came to the country aged 3, said the protesters wanted violent policemen to be put on trial before deeper issues of social inequality were tackled. “First the police need to be dealt with, then we’ll get to all the other (official) bodies that screw over Ethiopians,” he said. 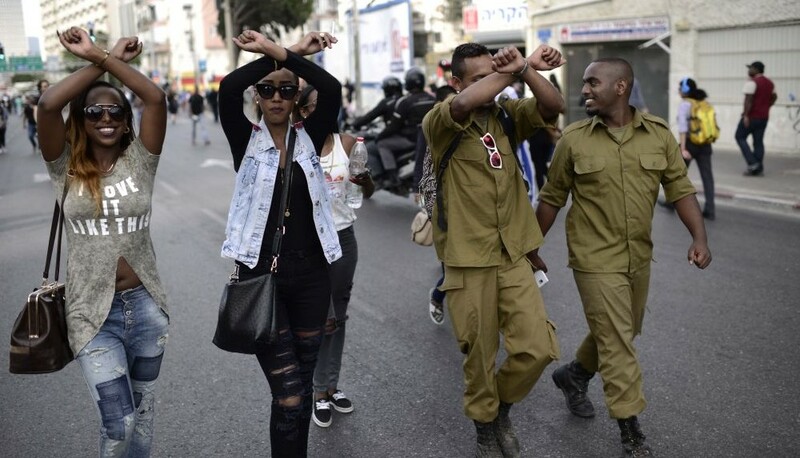 Zion Cohen, an Israeli participating in the demonstration, told AFP the Ethiopians were “a hundred percent right” to protest. “It’s a racist country and we don’t accept them,” he said. 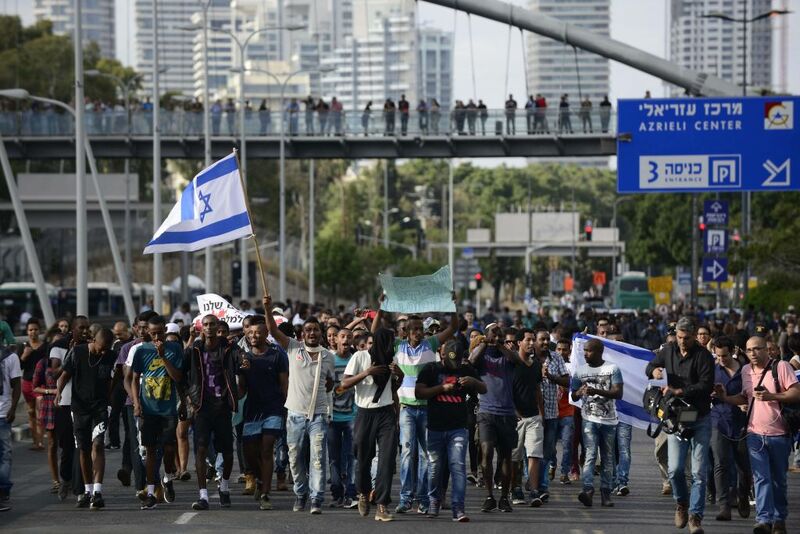 As the rally began in the afternoon, Netanyahu released a statement saying that on Monday he would meet Pakada, as well as other representatives of the Ethiopian community. 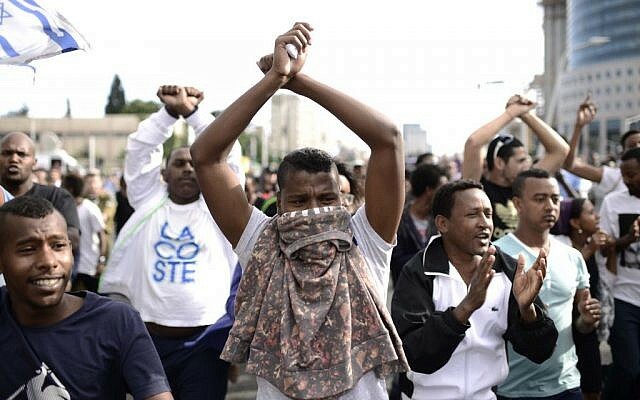 At a Thursday protest in Jerusalem, which was officially staged in order to highlight police brutality against members of Israel’s Ethiopian community, police deployed tear gas, stun grenades and water hoses against the protesters. Meanwhile, pockets of demonstrators threw stones and bottles at police and blocked streets as well as the city’s light rail tracks as they attempted to march on the Prime Minister’s Residence. 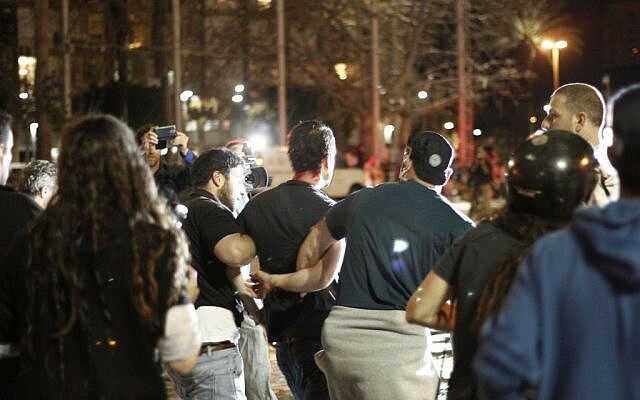 Three police officers were injured at the protest, along with as many as 13 demonstrators. Two were arrested. Shortly after 1 a.m. Friday, the last of the protesters went home. Police Commissioner Yohanan Danino has said that the officer who was filmed beating Pakada would be expelled from the police force, pending a hearing. Police had pledged a crackdown against those from the force who have used violence after the video footage went public.